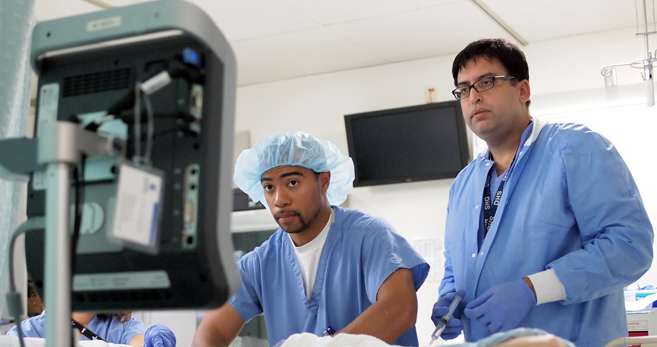 Harbor-UCLA has recognized the importance of regional anesthetic techniques for the overall comprehensive training of our residents and fellows, and more importantly, for the quality of care we provide to our patients. We have therefore established a team of attending anesthesiologists who have interests as well as skills in providing regional anesthetics. 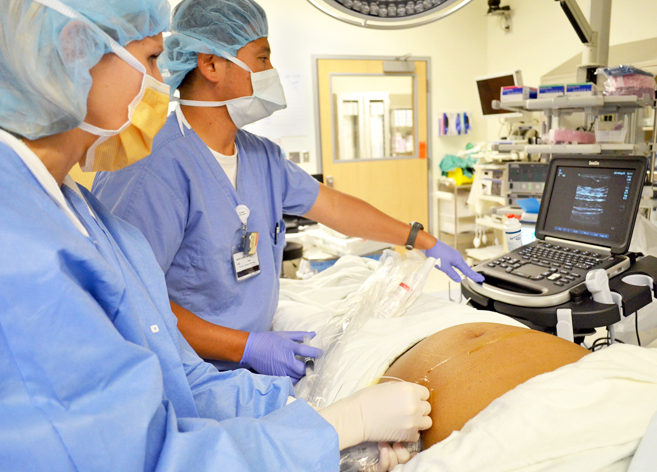 With the cooperation of many of our surgical services, we now encourage the utilization of these techniques as the sole anesthetic, or in combination with other types of anesthesia. Our residents and fellows are required to learn how to appropriately evaluate and select patients for regional anesthesia; the importance of proper informed consent for regional anesthesia; relevant anatomy; various approaches for performing the different peripheral nerve blockade; and the pharmacology and toxicity profiles of the local anesthetics. In addition, our residents learn how to recognize the side effects and complications of regional anesthesia, and how to manage those complications. The curriculum of the postgraduate fellowship position in regional anesthesia will mandate the fellow to master all technical skills required to perform basic as well as intermediate and advanced level blocks, in addition to being up to date on the most recent advances in equipment and techniques used in regional anesthesia. The fellow will also be expected to provide didactic and supervisory support to our residents in training, enhancing the current experience that our residents receive. Research in the area of regional anesthesia and preventive analgesia will also be supported and required. Presentation of this work will be encouraged via several different venues, including regional/national conferences as well as in peer-reviewed journals. The postgraduate fellow in regional anesthesia along with the attending staff will facilitate the placement of peripheral nerve blocks in a pre-operative holding area such that adequate surgical anesthesia will be established before the patients are taken to the operating room. This will improve turnover of the operating room, allowing more surgical procedures to be performed in a given day. In addition, the increased use of peripheral nerve blockade particularly with continuous catheter techniques is expected to decrease patient recovery time in the post anesthesia care unit, decrease post-operative pain medication requirements, facilitate post-operative care, and decrease hospital length of stay, all of which will increase the quality of care that our patients receive while still improving efficiency within the health care system at Harbor-UCLA. The regional anesthesia fellow will also have a primary responsibility for supervising the outpatient use of peripheral nerve blocks with continuous mechanical pumps infusing local anesthetics for pain control.